The Natchitoches Central High School Track and Field Teams competed in the Winnfield Tiger Relays March 23. The girls team had their best finish so far this year by placing second overall. The boys also finished well by placing third overall among the competition. The girls relay teams competed and scored points for the overall girls team by placing first in the 4×100 meter relay, second in the 4×200 meter relay and third in the 4×400 meter relay. 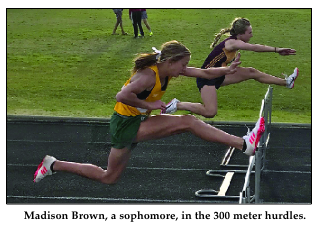 Madison Brown had another great meet with first place finishes in the pole vault, 100 meter hurdles and 300 meter hurdles. Tym’mia Helaire finished well in the sprint races by placing second in the 100 meter and 200 meter dashes. In field events, Jazzare Burrell placed second in shot put and Otesha Jackson jumped into a second place finish in the long jump. The boys relay teams also finished well with first place in the 4×100 and 4×400 meter relays. In the 200 meter dash, Kyronn Dunn placed first and in the 400 meter dash De’jon Blake also brought home a first place finish. In distance, Cooper Miller placed first in the 1600 meter run and Matthew Brown placed third in the 3200 meter run. In mid-distance, Dwon Stuckey placed third in the 800 meter run.